Joseph has been with Cushman & Wakefield | CRESCO Real Estate since its inception in February, 1991. Joe established a reputation as a results oriented overachiever and continues to focus on industrial/commercial real estate brokerage and consulting. His specific areas of expertise include the sale and leasing of industrial/commercial property, land sales and development, tenant representation and consulting services. Joe is also experienced in the procurement of tax abatement and other incentive programs available through local, county, state and the federal government. Additionally, globally strategic alliances provide Joe a unique capability of servicing his clients. As an industry leader, Joe’s in depth understanding of the Real Estate industry has qualified him to be a featured speaker and panelist at industry events. 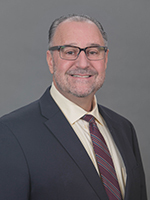 Joe started his commercial real estate career in 1986 after enjoying eight (8) years as a major account team sales manager with the Xerox Corporation. Joe then worked as an industrial specialist with Grubb & Ellis for five (5) years before co-founding CRESCO Real Estate. AB Biynah, LLC/Great Lakes Industrial Portfolio, seven (7) buildings throughout Northeast Ohio totaling 655,603 SF, investment portfolio sale - $44,550,000. 2477 EDISON BLVD 2477 Edison Blvd. FRENCH CREEK BUSINESS PARK E. River Rd & Preservation Blvd. 12117 BENNINGTON AVE 12117 Bennington Ave.
SHOREWAY COMMERCE PARK 799 E. 73rd St.
SABRE ENTERPRISES, INC. 12119-12141 Bennington Ave.